Since breaking his collarbone at round one, Jacob Argubright has been on a hot streak upon his return to the series. 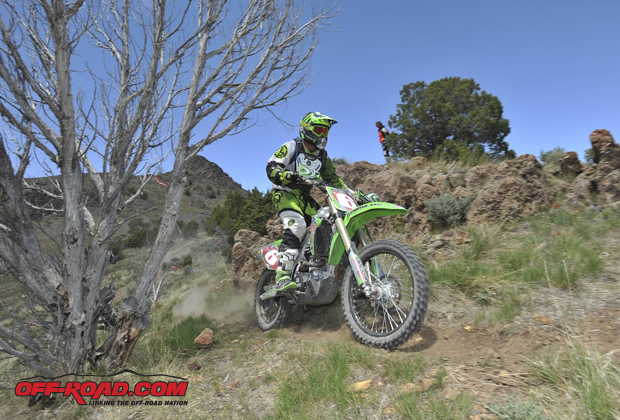 Third at round four, he finally got that long-awaited first National win at round five in Utah. 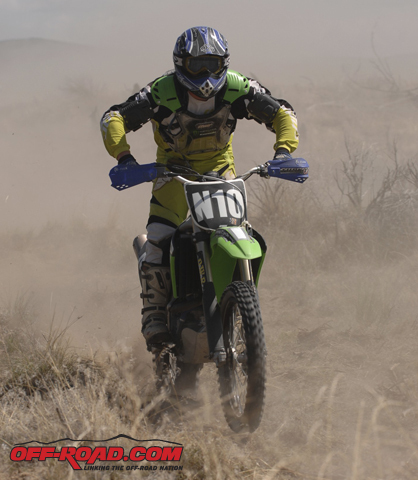 Monster Energy Kawasaki Team Green/Purvines Racing’s Jacob Argubright shook off the disappointment of a bad night at the opening round of the AMA Racing/GEICO EnduroCross Championship Series kickoff in Las Vegas to get his first-ever National triumph the next day at round five of the AMA Racing/Kenda National Hare & Hound Championship Series outside of Jericho, Utah. 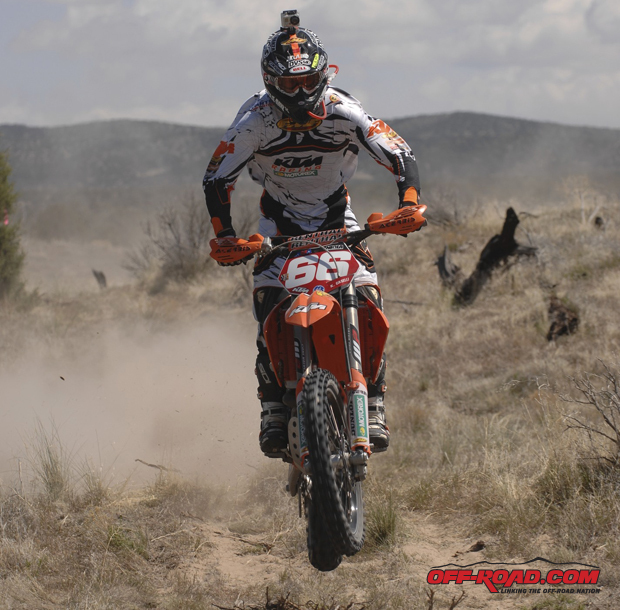 In doing so, he became the first racer besides Kurt Caselli to notch a victory this year, stopping Caselli’s win streak at four. And what happened to the FMF/KTM Factory Off-Road Racing Team star? Lack of finances keeps T.J. Hannifin close to home, but when the Nationals come to town, he’s always a podium threat--a feat he accomplished despite a bad start. back all afternoon, unable to punch through the dust to make a real run at Argubright. It marked his first podium at a National. 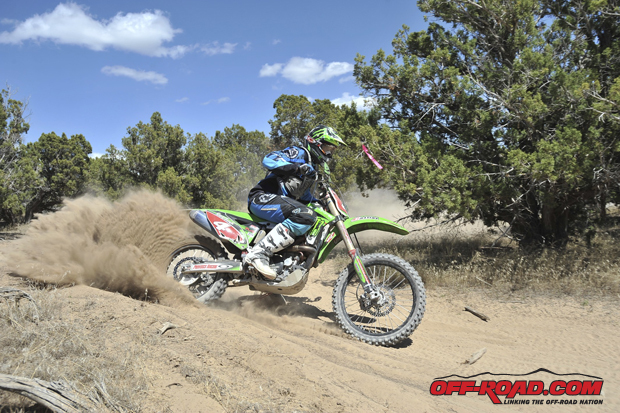 aboard his Pro Cycle Racing Kawasaki to claw his way back to third at the finish, just 15 seconds behind Morrow. Like Morrow, the dust made it impossible to get closer for a pass attempt, but he still won Open A.
him in the dunes all the way to the banners, but it didn’t work out as planned so like Hannifin, he spotted the field quite a few positions. By the end, he made it up to fourth place, the first time this season he’s failed to earn a spot on the podium, but with Caselli’s DNF, Pearson still made up a huge amount of ground in the points chase. It was a banner day for Kawasaki. 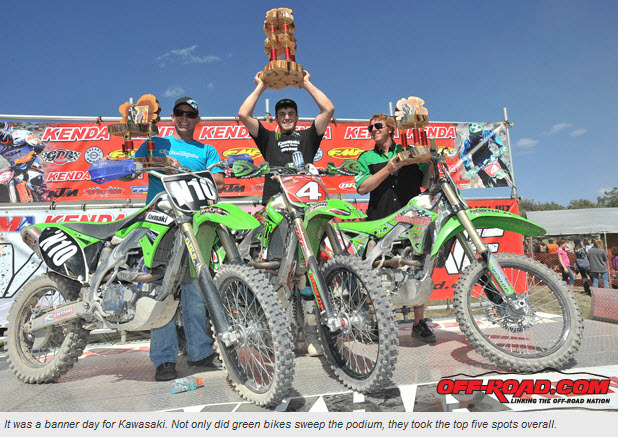 Not only did green bikes sweep the podium, they took the top five spots overall. After choosing what turned out to be a slow line off the start, David Pearson had his work cut out for him and battled back for fourth place, the first time this season he’s been off the box. Still, he made up a lot of points on Caselli and now trails by just six points, 120-114, unofficially. 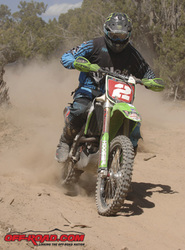 A third Purvines Racing Kawasaki racer—Nick Burson—ran in the lead pack all day and ended up fifth for the third race in a row. Johnny Campbell Racing Honda’s David Kamo also ran well—until he reached the alternate fuel stop on the first loop and couldn’t find his gas can. After several others passed him in the pit, he finally got fueled up (no outside assistance was permitted at the two alternates) and would end up sixth followed by Nick Thompson (another local and the second Open A), Cody Shafer, Brady Elton and 250cc A winner Skyler Howes.